Medical News Today: How are raw honey and regular honey different? It’s no secret that tacos are my favorite food EVER. Back when I was following a strict paleo diet in order to heal my autoimmune condition I used to joke that my diet was “Paleo + Tacos” because tacos, with their warm, soft corn tortillas were the one thing I couldn’t (or wouldn’t) give up. That was, of course, before cassava flour and grain-free tortillas were a thing. I no longer follow a strict paleo diet – or any diet for that matter (I’m just an omnivorous eater with a love for fruits and veggies in case you’re wondering) – but lately I’ve fallen in love with the texture of these grain-free tortillas as another gluten-free option for our weekly taco nights. My daughters go crazy for them and until I told them they weren’t gluten-filled flour tortillas they had no idea that they weren’t the ‘real deal’. 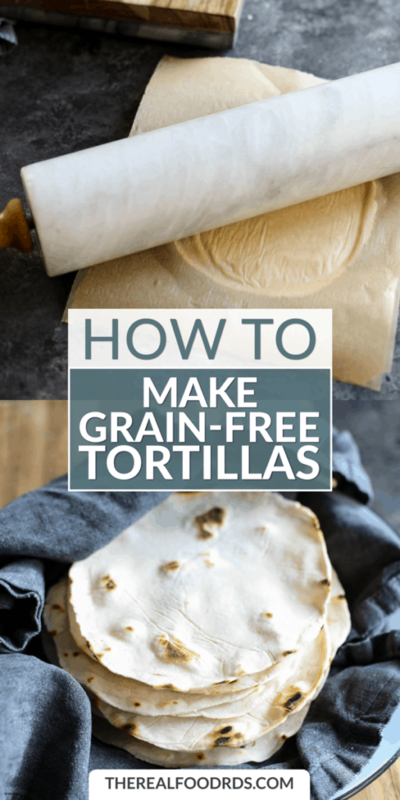 I think you’ll also find that to be true once you see how truly easy it is to make your own grain-free tortillas at home using cassava flour. Cassava flour is produced from the whole root of the cassava or yucca plant, a crop native to South America, Asia, and Africa. Its cousin, tapioca starch, is made by dehydrating the starchy liquid created by soaking ground cassava root whereas cassava flour is made by guiding the dried root into a fine powder or meal. 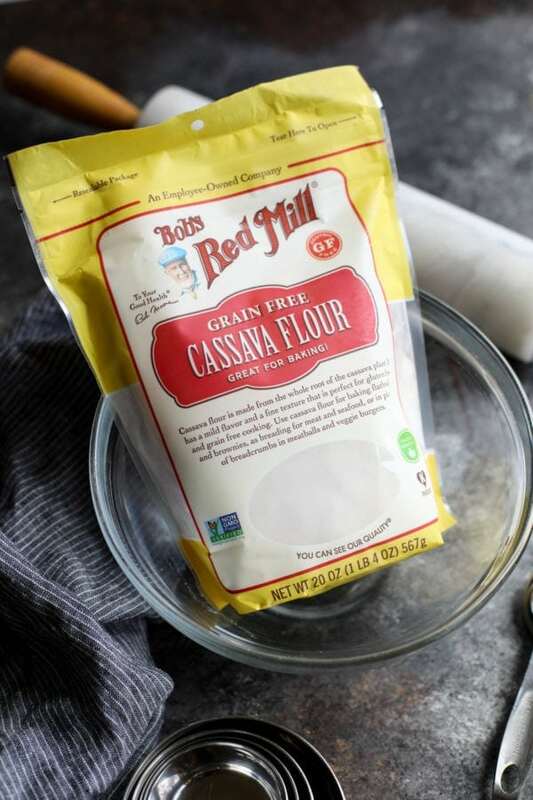 Cassava flour has recently become popular in gluten-free and paleo baking because it’s naturally gluten-free and nut-free and it binds together better than many other gluten-free flours and thus you’re less likely to need binders and gums to create a satisfactory product. Is cassava flour good for you? While cassava flour isn’t good or bad it’s worth noting that it does not offer any nutritional value to your diet as it’s nearly 100% starch and thus devoid of protein, vitamins, and minerals. However, that does not mean that you can’t enjoy foods made with cassava flour – just use them as part of diet that’s based on whole, unprocessed or minimally processed food and see them for what they are – a “fun” food that enhances the eating experience rather than a staple of the diet…kind of like cookies, chips and other fun foods that provide variety in the overall diet. Place dry ingredients (cassava flour, garlic powder, and salt) in the bowl. Whisk to combine. Create a well in the center of the dry ingredients using the back of a large spoon. Add oil and ¼ cup warm water. Stir until the mixture starts to pull together into a ball. 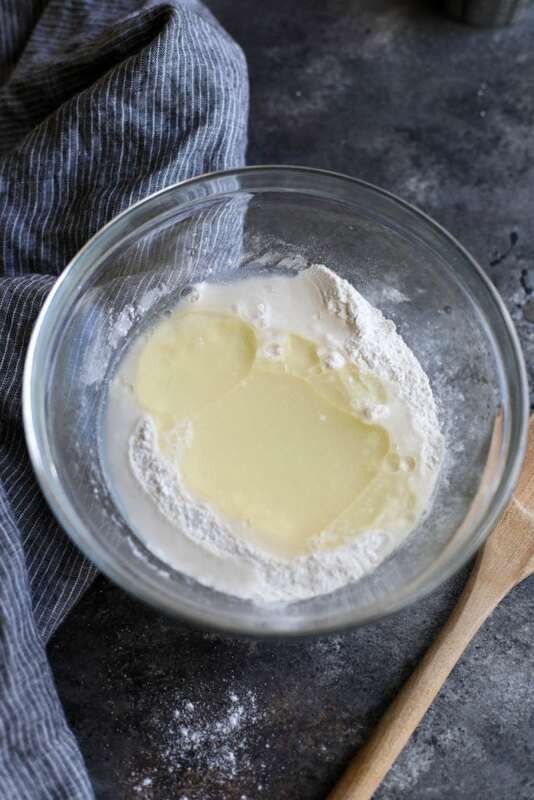 You won’t be able to incorporate all of the flour into the dough by stirring so you’ll need to get your hands in the there and gently knead the dough into a smooth ball. If the dough appears to be dry add a little more water a few teaspoons at a time. The dough should be firm and springy and smooth to the touch – not sticky, dry or crumbly on the surface. When the dough is the right texture, cover the bowl with a clean kitchen towel and allow the dough to rest for 5 minutes before dividing the dough into twelve equal portions (for taco-size tortillas) or six portions for burrito-size tortillas. While the dough is resting, prepare to roll out the tortillas. I’ve found that a tortilla press works best and is one of the best under $20 investments I’ve ever made. Of course, you don’t need a tortilla press to make grain-free tortillas, a rolling pin and a couple of sheets of parchment paper will also work though it’s slightly more work and your tortillas may be slightly misshaped (but they’re still delicious which is all that really matters). After the dough has rested, place a large skillet over medium-high heat. 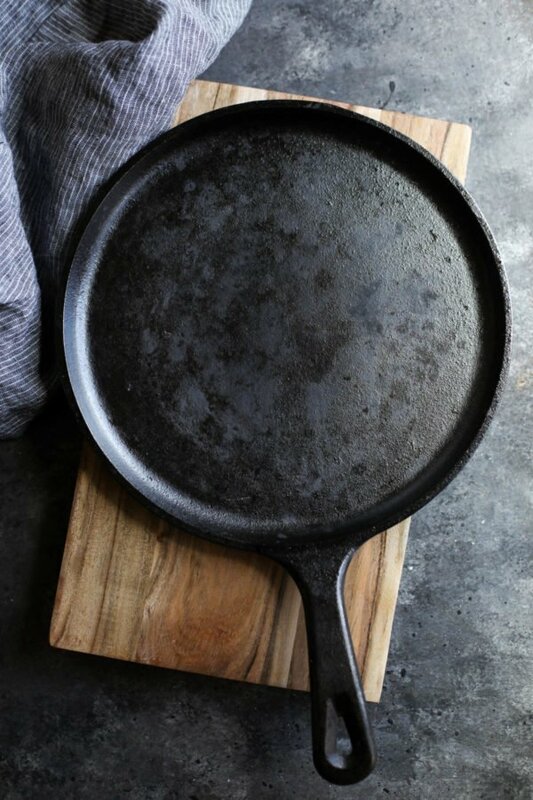 I use a cast iron griddle pan like this because it heats evenly, retains heat better than other types of skillets and gives the best results, in my opinion. Of course, if you don’t have a cast iron skillet you can use what you have but again, it’s another one of the best low dollar investments you’ll ever make. Find something to line your press with. 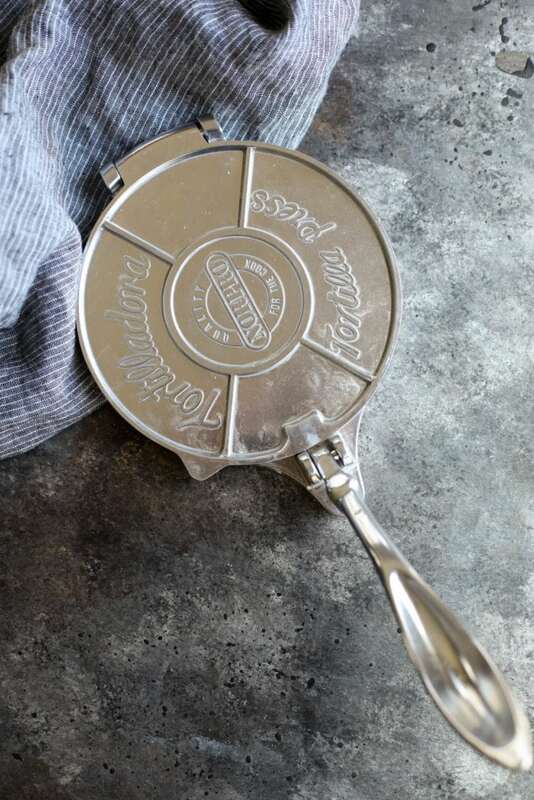 This will keep the dough from sticking to the press and make it super easy to transfer the tortilla to the hot pan when it’s time to cook. Two pieces of parchment paper about 8″ x 8″ works great. So does a quart-size plastic bag when you use scissors to cut off the zipper top then cut down both sides to make a rectangular plastic sheet with a fold in the middle (scroll down to see photos below). You can wash and reuse the bag many times so don’t toss it out when you’re done here. 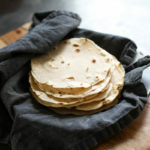 The plastic bag is actually my preferred method when I make corn tortillas but for these grain-free tortillas, I actually found it easier to remove the pressed tortilla from the surface of the parchment paper than the plastic but use whatever you prefer or works best for you. 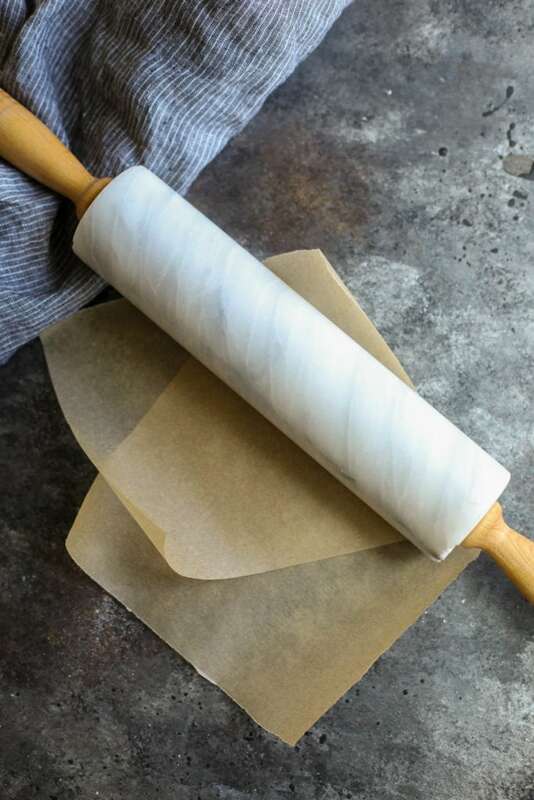 You’ll place the dough between the sheets of parchment paper and use the rolling pin to roll the dough into a thin, flat disk. 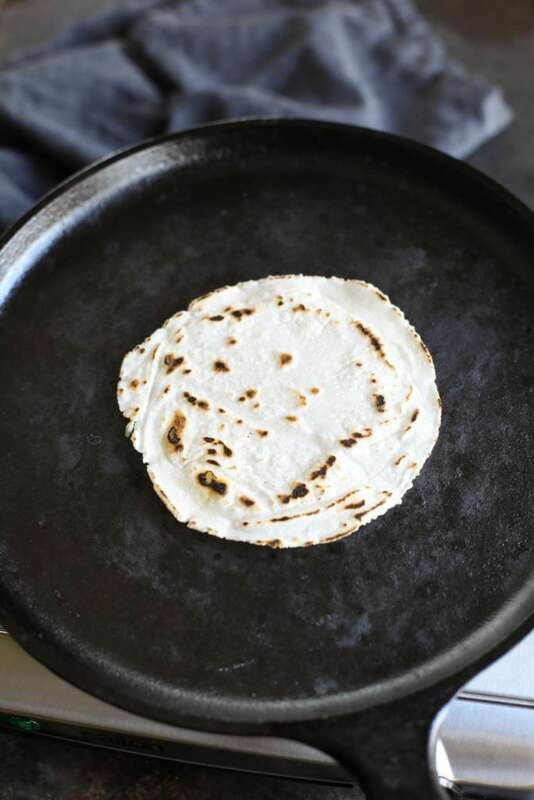 Warning: This method produces less than perfectly round tortillas unless you’re really good at rolling with a rolling pin – BUT it gets the job done. Place tortillas, one at a time (or two at a time if you made them small and your skillet is large) into the hot skillet and cook for one minute until the dough starts to puff slightly, appears dry to the touch and has light brown spots on the underside surface. Then carefully flip the tortilla and cook another minute. Transfer tortillas to a plate and cover with a clean kitchen towel to keep them warm and pliable until you’re ready to serve. Can grain-free tortillas be made ahead of time? Yes. You can make these tortillas up to 3 days in advance and reheat as needed. Just be sure to cool the tortillas completely before storing them in a covered container in the fridge. Placing a sheet a parchment paper between each tortilla before refrigerating or freezing will make them easier to separate later on. If they do stick together, don’t panic just place the entire stack in the microwave or oven to allow them to warm just enough until you can peel them apart. Can grain-free tortillas be frozen? Yes. Place completely cooled tortillas in a container with lid (or freezer-safe bag like this one) and freeze flat. Placing a sheet a parchment paper between each tortilla before refrigerating or freezing will make them easier to separate later on. What is the best way to reheat grain-free tortillas? For best results, allow tortillas to thaw at room temperature before reheating (doing so from frozen MAY make them soggy). Reheating them but tossing them into a hot, dry skillet is the preferred method, however, 10-15 seconds in a microwave, covered with a paper towel, will also do. 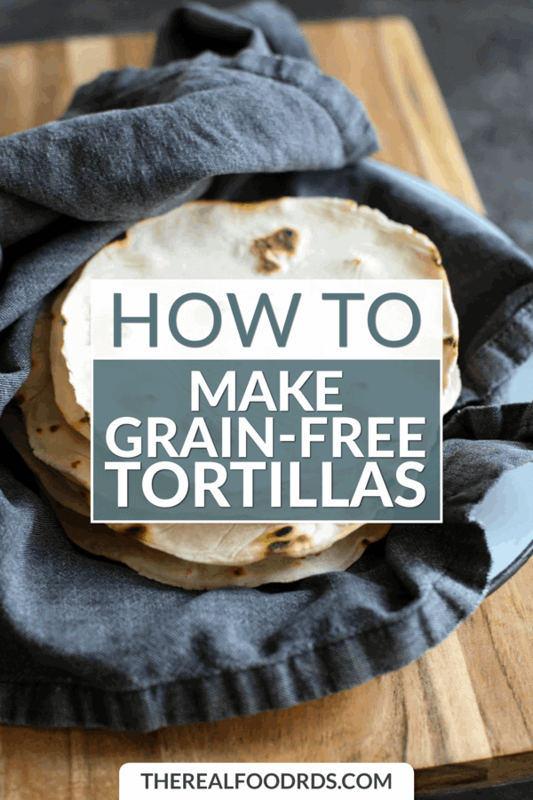 What should I serve grain-free tortillas with? Slow Cooker Chicken Tacos, Slow Cooker Beef Barbacoa, One-Pan Chicken Fajita Bake, beef taco meat made with Homemade Taco Seasoning or Vegan Califlower Sweet Potato Tacos. Are these gluten-free? Yes. Cassava flour is naturally gluten-free. Are these Whole30-friendly? No. Although they do not contain any grains or sweeteners and are made entirely with compliant ingredients no bread-like products are allowed on the Whole30 program. 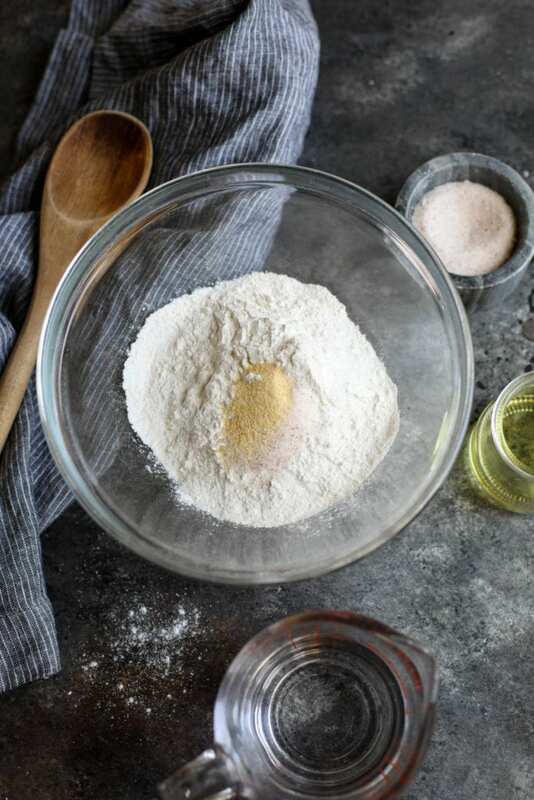 Place dry ingredients (cassava flour, garlic powder, and salt) in a bowl. Whisk to combine. Create a well in the center of the dry ingredients using the back of a large spoon. Add oil and ½ cup warm water. Stir until a dough forms. Add more water, a little at a time, if the dough appears to be dry. The dough should be firm and springy and smooth to the touch – not sticky, dry or crumbly on the surface. When the dough is the right texture, cover the bowl with a clean kitchen towel and allow the dough to rest for 5 minutes. Divide dough into 12 equal portions (for taco-size) or 6 portions (for burrito-size) depending on how large or small you want them to be. 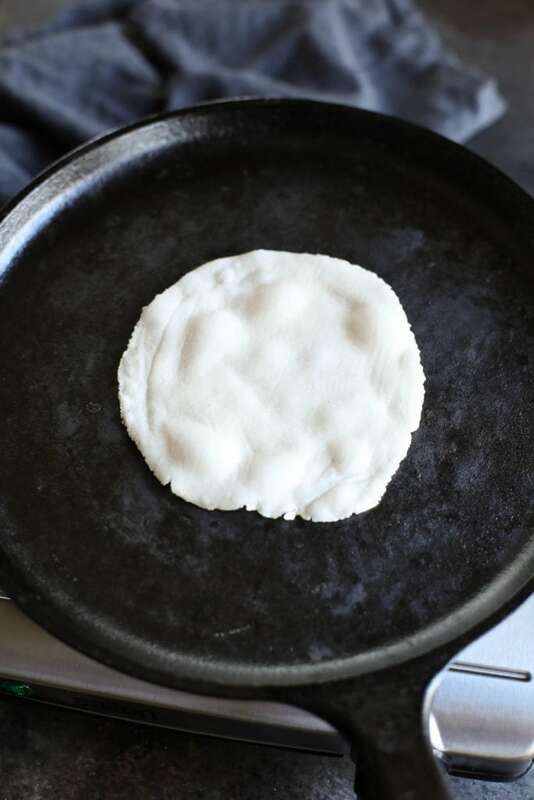 Use a tortilla press or rolling pin with dough between two sheets of parchment paper to flatten tortillas to less than ⅛-inch thick circles. If making larger, burrito-size tortillas you’ll need to roll them out with a rolling pin rather than a tortilla press. Cook tortillas in a hot, dry skillet for 1 minute on each side until the dough starts to puff slightly, appears dry to the touch and has light brown spots on the surface. 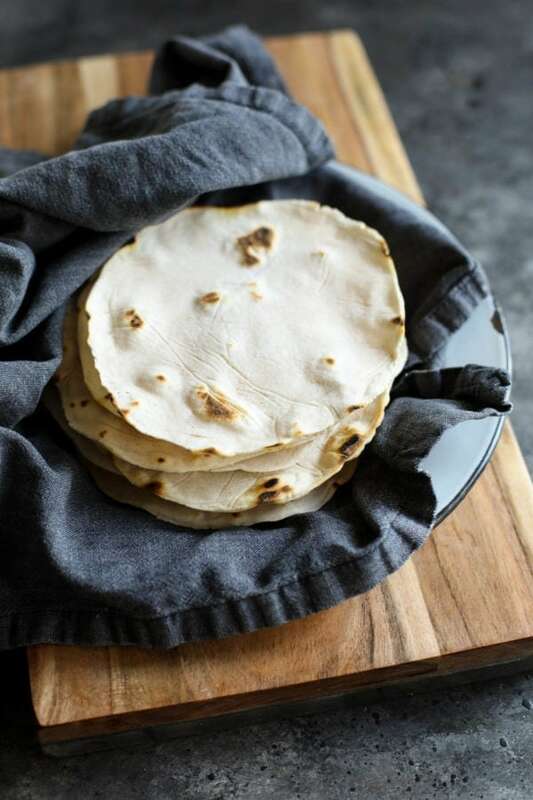 Transfer tortillas to a plate and cover with a clean kitchen towel to keep them warm and pliable. Serve and enjoy! What’s your go-to when it comes to tacos? Are you on team corn, cassava or flour? Share in the comments below!